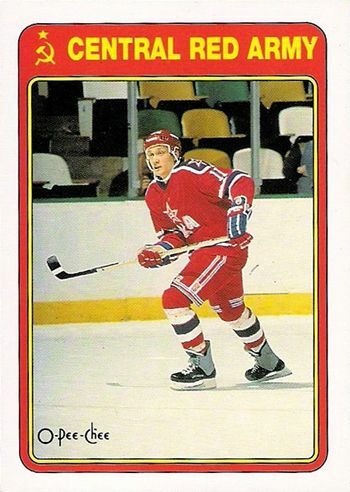 Born on this date in 1967, right winger Evgeny Davydov started his career with his hometown Traktor Chelyabinsk with 5 games in the 1984-85 season. That season his international career began with the European U18 Junior tournament. He became a regular the following season with 11 goals and 16 points in 39 games. 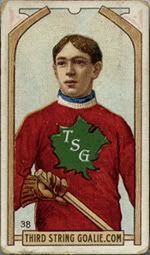 During that season he also competed in his first World Junior Championship, scoring 3 goals and 4 points in 7 games as the Soviets won the gold medal. 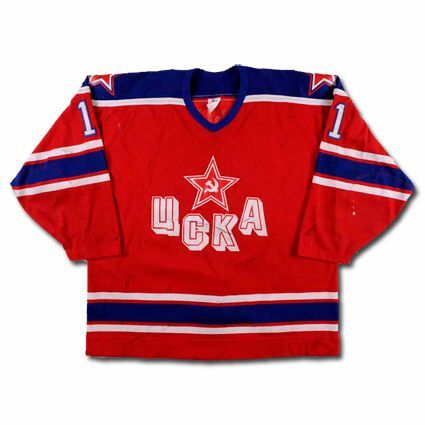 As was often the case during the time of the Soviet Union, the players recognized as being the best in the land found themselves becoming members of the Soviet Red Army and being assigned to play hockey for the army's sports club, CSKA Moscow, also known as Central Red Army. There were many benefits to playing for Red Army, as the majority of the Soviet Union National Team was comprised of the Red Army squad. The downside was living life under the stern oversight of head coach Viktor Tikhonov, who had strict control of the player's lives for 11 months a year. Davydov's Red Army career began with the 1986-87 season with 11 goals in 32 points on the high powered club. Davydov also returned to the World Junior Championships in 1987. Things did not go according to form however, as the Soviets entered their final game with a 2-3-1 record in their game against rivals Canada, who needed to win by five goals to secure the gold medal. With the Canadians leading 4-2 with 6:07 left in the second period, a fight broke out which led to Valeri Zelepukin, who was playing hurt with a separated shoulder, being pummeled by Mike Keane. Davydov left the Soviet bench to come to Zelepukin's rescue, which sparked the most infamous bench clearing brawl in international hockey history. The officials were powerless to break up the battling players and eventually left the ice and had the lights turned off in the arena in an attempt to end the fighting. 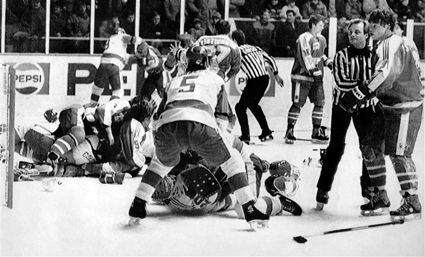 Eventually, after the brawl lasted some 20 minutes, both teams were disqualified from the tournament, which cost Canada a medal since they were guaranteed at least a bronze. The incident became known as The Punch-up in Piestany. Davydov would play five more seasons with CSKA at the end of their incredible dynasty, winning Soviet League championships in 1987, 1988 and 1989, a Soviet Cup in 1988, the IIHF European Champions Cup four times from 1987 to 1990 and a Spengler Cup in 1991. His best seasons with Red Army came in 1989-90 with 17 goals in 44 games and in 1991-92 with 25 points in just 27 games. 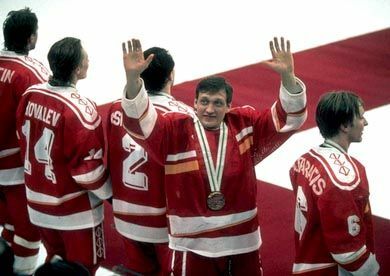 During that time period, Davydov would appear in his only World Championship in 1990, where he scored 5 goals and 9 points in 9 games as the Big Red Machine of the Soviet Union would win it's final of 22 gold medals. Also during this period of Davydov's career, massive changes were happening politically in the Soviet Union and the country ceased to exist in late December of 1991 while preparations were being made for the upcoming 1992 Olympics in Albertville, France. While the Soviet Union ceased to exists, a coalition of former member states competed together as the Unified Team. 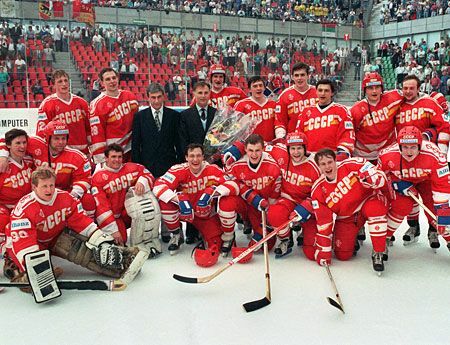 So short were the preparations before the Games, that the Unified Team wore the same Soviet jerseys as before, only with the letters CCCP removed. On the home white jerseys there was even the curvature around the "P" remaining! No matter what they were called, these were still the elite of the Soviet hockey system, who roared through the competition with a 7-1 record to defeat Canada 3-1 in the final to win the Olympic gold medal to go with his World Championship and World Junior gold. With his Olympic obligations to the Motherland now completed, Davydov began the next phase of his career as he reported to the Winnipeg Jets for the final dozen games of their NHL schedule where he impressed with 4 goals and 7 points followed by his first playoff experience with an additional 7 games. 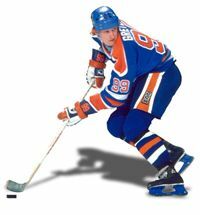 Davydov then completed his first, full NHL season in 1992-93, showing good promise with 28 goals and 49 points in 79 games, nearly twice as many as he had ever played during a Soviet regular season, where his previous maximum was 44. Also of note was his +/- rating of -2, showing he was not a one way defensive liability. 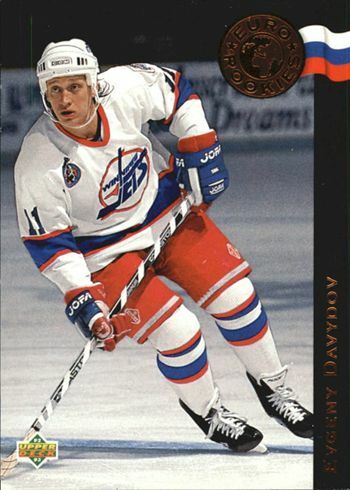 Despite the promise shown by Davydov in 1992-93, he was considered expendable in light of the Jets having a lineup that consisted of the likes of rookie superstar Teemu Selanne, Thomas Steen, fellow Russian Alexei Zhamnov, Darrin Shannon and Keith Tkachuk which resulted in Davydov being traded in September of 1993 to the expansion Florida Panthers. 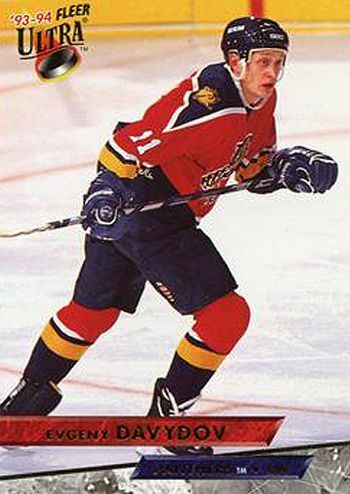 Life with the expansion Panthers was difficult and not a good fit for Davydov, and after just 21 games and a mere 2 goals, he was traded to the Ottawa Senators in January of 1994 where he fared no better, scoring just 5 goals in 40 games for the even more offensively challenged Senators. 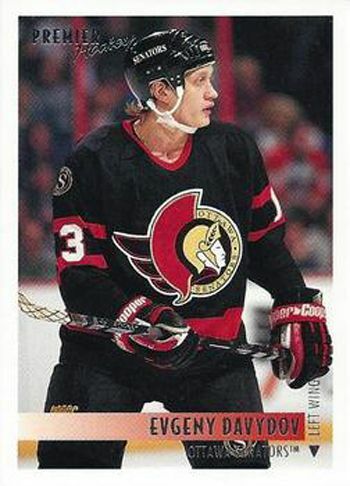 His 1994-95 season cannot be descirbed as anything but a bust, as Davydov played just 3 NHL games with Ottawa, scoring just once. He also saw action in 11 games for the San Diego Gulls and 18 with the Chicago Wolves, both of the IHL. His final NHL totals were 155 games played, 40 goals and 39 assists for 79 points. The remainder of his career was spent back in Europe, where he spent the next ten seasons meandering through its various pro leagues. 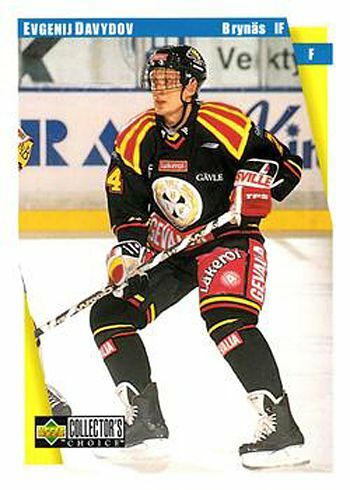 1995-96 saw Davydov play 7 games with EHC Olten of the Swiss second division followed by 3 regular season and 13 playoff games with HC Amiens in France, highlighted by 15 goals and 24 points during the playoffs. The next two seasons brought a measure of stability, as he signed with Brynas IF Gavle in Sweden, scoring a league leading 30 goals and 48 points in 46 games in 1996-97 followed by a 33 point season in 40 games with Brynas in 1997-98. He was on the move again in 1998-99, splitting time between Ak Bars Kazan of the Russian Superleague (14 games) and EV Zug in Switzerland (11 games). For the next two seasons, Davydov was back with Olten in the Swiss second division, where he excelled with 26 goals and 56 points in 1999-00 before setting career highs in 2000-01 when he cut loose for 31 goals and 80 points in 40 games, an average of two points per game. He could not sustain that success however, as 2001-02 saw him struggle with 2 goals in 7 games with Karpat Oulu in Finland followed by 5 goals in 34 games with the Berlin Capitals in the German DEL. If possible, Davydov's 2002-03 season was worse, as he only managed cameo appearances which amounted to 5 scoreless games with Krylja Sovetov Moscow (Soviet Wings) followed by a mere 2 games with HC Milano in the top Italian league, where he scored his lone goal of the season while acquiring another stamp in his passport. In 2003-04, he showed some signs of his past promise. After 12 games with Olofstroms IK in the Swedish second division, Davydov again returned to Russia, only this time in the third division with Velkom Moscow, where he scored 10 goals and 30 points in 30 games. His final season of play was with Titan Kiln, also in the Russian third division, where in 32 games he wrapped up his career with 7 goals and 25 points. After starting his career with the prestige and stability of playing with Central Red Army and winning three league championships and three gold medals in the World Juniors, World Championships and Olympics, his move to the NHL, which looked promising after his first full season in Winnipeg, ended quickly 64 games later and he began a journey through the hockey wilderness, never spending more than two consecutive seasons with any single team, as he moved among ten leagues spread among seven countries - Switzerland, France, Sweden, Russia, Germany, Finland and Italy. 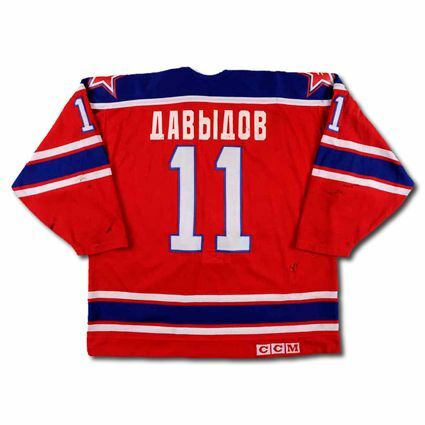 Today's featured jersey is a 1988-89 Central Red Army Evgeny Davydov jersey. 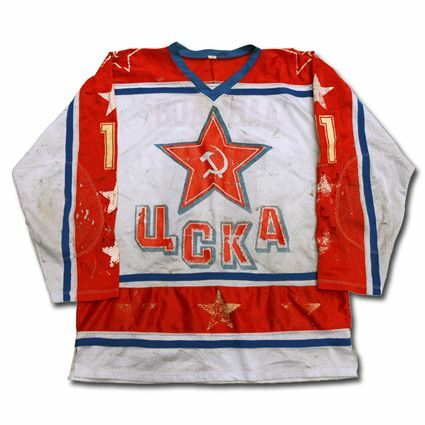 Unlike today's featured jersey, this is a prime example of a typical Soviet jersey from the era that has been hammered with game use that has worn the combination of silk screening and heat pressed graphics, which have been both ground off or peeling off, particularly along the waist stripe, lower left arm and lower torso. The Super Series of games, in which Soviet Club teams came to North America to play exhibition games against NHL club teams, gave the top Soviet clubs who came over in 1989 and 1990 (Red Army, Dynamo Riga, Khimik Voskresensk, Soviet Wings and Dynamo Moscow) an injection of cash and a nice, new set of top quality jerseys. 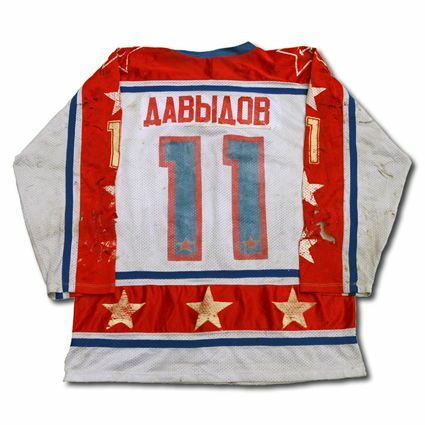 While some of the team's jerseys appear to have been worn for games back in the Soviet Union with Cyrillic names added, Red Army in particular, others were likely sold following the final game of the club's North American tour, probably in one of a few different manners, either as a complete team set to a well funded memorabilia seller in a shady deal out of the back door of the locker room by the team's head coach for personal gain or individually by the team's equipment manager as an impromptu garage sale to the lucky fans who happened to be in the area or the the knowledgeable individual collector hoping for just such an opportunity after the Soviet's final game before heading home. 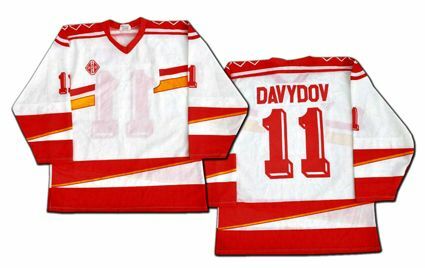 Bonus jersey: Today's bonus jersey is a 1990-91 Central Red Army Evgeny Davydov jersey as worn during his time with the most dominant club in the history of hockey. Unlike many of the somtimes paper thin mesh jerseys with silkscreened or heat sealed graphics as seen in today's featured jersey, this Red Army jersey is a top of the line, Canadian-made CCM jersey produced to the same standards as one would find in the NHL and very likely produced for use in the 1989, 1990 or 1991 Super Series and then converted to Cyrillic names for use back home in the Soviet League. 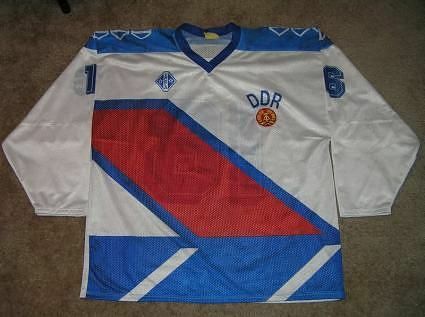 Extra bonus jersey: Today's extra bonus jersey is a 1992 Unified Team Evgeny Davydov jersey as used in the 1992 Winter Olympics in Albertville, France. With the upheaval of the political situation in the Soviet Union in 1991, there was little time to sort out what kind of identity the brand new team made up of six of the 15 former Soviet republics would compete with. 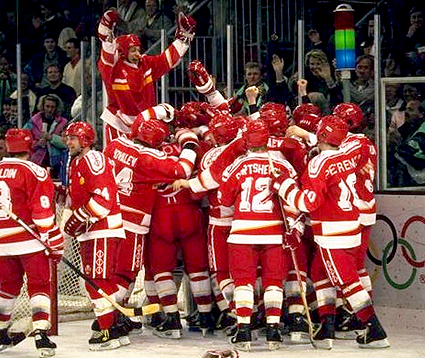 The Unified Team competed under the Olympic flag, and with just five weeks before the games were to commence, the jersey supplier to all the Olympic teams, Tackla of Finland, made up a set of the usual Soviet Union jerseys, only without the "CCCP" lettering across the chest. Note they did not even alter the chest stripes, which were still notched on the left hand side for the curvature of the "P"! 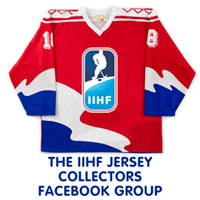 This was the one and only appearance for these stop-gap jerseys, as Russia competed in a new set of jerseys at the 1992 World Championships held just two months later in April as an independent nation, separate from the other five countries of the Unified Team. 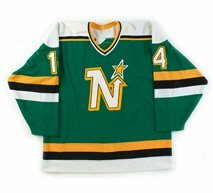 Unlike the screened or heat pressed Soviet jerseys, this Tackla jersey uses the dye sublimation process, in which each jersey starts as a white blank jersey and then has all the graphics dyed into the jersey, not added onto the jersey, a much superior process which is permanent and allows the jersey to retain its vibrant colors indefinitely. Today's video selection is the gold medal game from the 1992 Olympics, as the Unified Team, wearing their jerseys without any national identity, captures the gold medal against Canada, followed by a brief clip of the medal ceremony.